This festive Season you could be bagging your own sprig of Holly for a snip of it’s usual price. 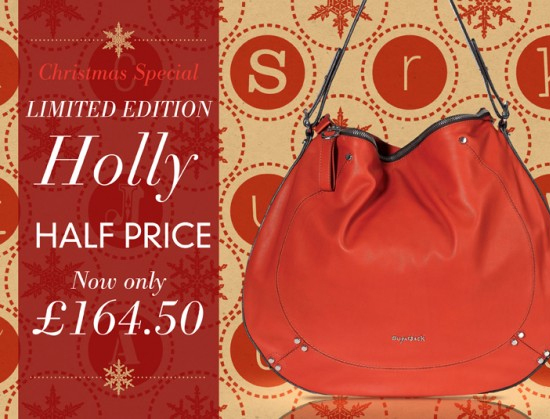 The season of goodwill has kicked in at Sugar HQ and until Christmas Eve our Holly Red Ltd Edition Luxury Leather Slouch Bag is avaialble at half price. Now only £164.50 and available whilst stocks last. The chocolate leather handle strap wraps beautifully around the bag and the fine, detailed metal hardware adds to its charm. Three large separate compartments hold all your essential personal and baby requirements, with the centre compartment containing the Sugarjack removable ‘baby organiser’ compartment ensuring the bag can quickly transform into a stunning handbag. The ultimate fashion baby changing bag.